Tomato season took its sweet time coming to the Northeast of America, but now that it is here, I have returned to my annual tomato-based diet. I’m spending a veritable fortune on heirlooms, and my olive oil bottle has got suspiciously light. I don’t see the point of eating tomatoes a minute out of season, and I’m sure you feel the same. I don’t even factor them into my thinking from late September onwards. If a recipe absolutely calls for them, I compromise by buying cherry tomatoes and roasting them with olive oil and thyme. One of the things I miss most about living in Russia is the tomatoes. Each March I waited with eager anticipation for the first of the large, juicy beef tomatoes to arrive from the sunnier climates of Central Asia. 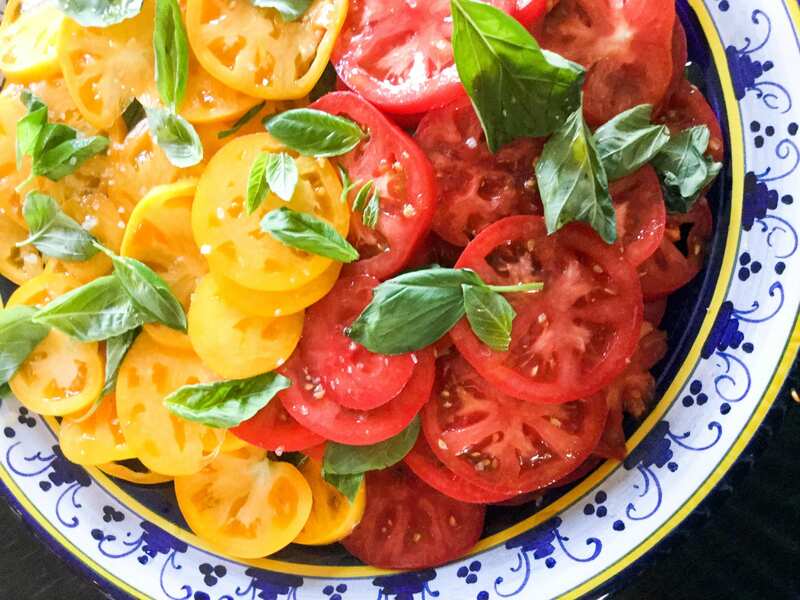 As spring turned to summer, the tomato crop made its way north, and smaller, rounder tomatoes from Rostov-on-Don and the Russian foothills of the Caucauses would appear in the market — perfect for slicing into quarters and serving with chopped basil, lemon juice, and olive oil. Interested in other tomato recipes? Try this one! I once hosted a dinner party in Moscow, during which my idea that you can never have too many tomatoes was seriously challenged. Most of the guests were friends of HRH, my “handsome Russian husband,” which I mention because none of my friends would ever do what one guy did. He was about 3 hours late, which may seem rude to you (it did to me) but apparently we had to put up with it because he was something hugely important in the Russian government. I looked him up on kremlin.ru the next day and, oddly I couldn’t find him there. Go and figure, right? Nevertheless, he seemed to feel he had complete license to behave badly. He’d been to Azerbaijan and came directly from the airport with a plastic bag of ripe Baku tomatoes. Instead of apologizing profusely for the fact we’d held dinner for him, he insisted on going into my kitchen and cutting up and serving his tomatoes even though, there on the counter, right in front of him was a massive platter of my Rostov-on-Don tomatoes ready to go — glistening with their light dressing of lemon juice and olive oil. He put a ton of vegetable oil on his and didn’t want any of my large bunch of basil. This to my way of thinking is a travesty, but no one wants to hear it from a girl in Russia. Not even about tomatoes. And it’s this kind of guy that I don’t miss about living in Russia. So, we had a ton of tomatoes left over, so many that I was forced to get creative, and that’s when I tried this recipe for the first time. And the second, and now that I think about it, the third. This tomato and bulgur salad is a great example: wonderful on its own, or as a base for grilled meat and fish, atop a plate of crisp, lightly-dressed, peppery greens such as arugula, or topped with grilled eggplant, zucchini, and goat cheese. Bulgur is an ancient grain, best known as the basis for tabbouleh. It is made from boiling wheat, then drying and cracking it. It’s not, therefore, gluten-free, but it does pack a ton of fiber. 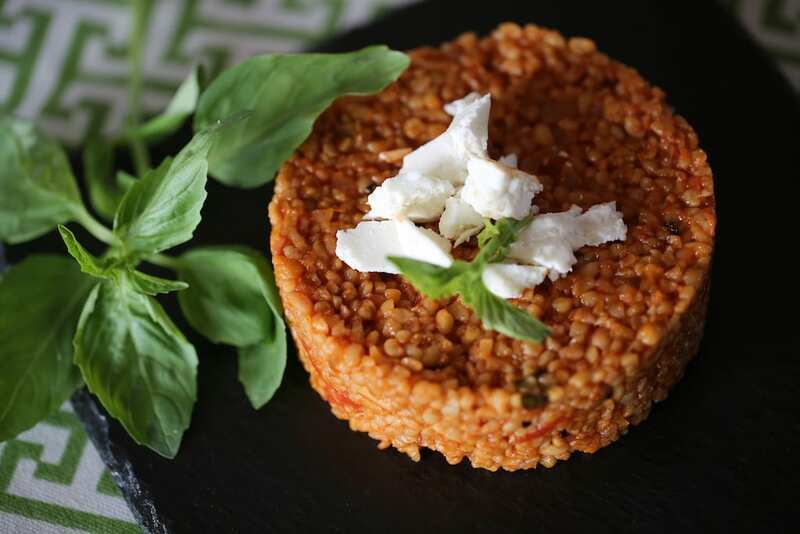 Bulgur is a staple for the hearty grain-based dishes of the Middle East and also very popular in dishes from the Caucuses, where it plays the same role that pasta does in European dishes. 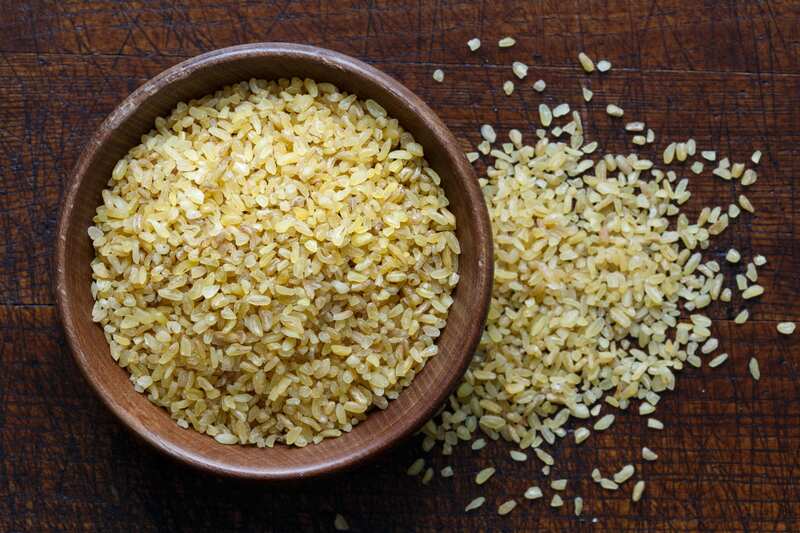 Unlike some of the trickier grains, bulgur is very easy to prepare. If you have a ton of time: soak the bulgur overnight in 1:5 ratio of grain to water. Drain the grains, then cook the grains in a 1:1.24 ratio of grains to water until all of the water is absorbed. If you have less time: toast the grains in a light skim of olive oil until they are golden and beginning to give off a pleasant nutty odor. Then add the water in the 1:1.25 ratio and simmer until the liquid is absorbed. For this method, and so many others, plus delightfully inspiring recipes for quinoa, buckwheat, and other grains, I rely very heavily on the wonderful Maria Speck’s authoritative book, Ancient Grains for Modern Meals. The recipe below is adapted from one of hers, and the moment it appears on the table, it disappears! 1 lb ripe heirloom or cherry tomatoes cut up into cubes at the last minute. Heat the olive oil in a deep skillet or Dutch Oven over medium heat until it is shimmering. Add the onion and garlic and a pinch of the salt until the aromatics are soft and beginning to brown (3-5 minutes). Add the tomato paste and sugar and cook over medium heat until the paste begins to turn brown in color. Add the wine and use the back of a wooden spoon to scrape up the bits on the bottom of the skillet as the wine quickly evaporates. Add the stock, tomatoes and bulgur and stir to combine as you bring the mixture to a gentle boil. Lower the heat to medium low to achieve a steady simmer, then cover and cook until the liquid is completely absorbed. You can add water if necessary, but be sure to do so in small amounts to avoid a soupy consistency. Taste and adjust seasoning by adding more salt if you need it. Remove from heat, cover and set aside until cooled to room temperature. When ready to serve, fork the bulgur up to fluff it, then toss it with half of the basil. Arrange on a platter on top of lightly-dressed greens or on its own. Top with crumbled goat cheese and chopped tomatoes. Do not put the chopped tomatoes on the salad until just before you are ready to serve the meal! For more happy marriages of grains and vegetables, I highly recommend these excellent cookbooks! They are both out on my counter almost weekly, and I find much inspiration from both. You will too. Market Cooking: Recipes and Revelations, Ingredient by Ingredient by David Tanis. If you are the kind of person who can’t resist those fantastically emerald green pea shoots at the farmer’s market only to come home and think, “what on earth do I do now?” then this book is for you. I received it as a gift from a dear friend who knows that I am just this kind of market maven, and I have gleaned so many ideas from the book that I will soon need another copy. Tanis brings together recipes from around the culinary world, organizing them by the key ingredients you find at a market. If you’ve ever wondered how to tame celeriac, then look no further. This is your book. When my salad mojo flags (which, admittedly, happens only very rarely) I turn to this beautiful book for a tune-up. Rosen takes you through the “Saladish Manifesto” on how to turn any salad into a meal or any meal into a salad! Subscribing to my belief that well-stocked fridges and pantries contain everything you need to get dinner on the table in under 30 minutes, Rosen offers four sections calibrated for the seasons, as well as advice on how to make well-balanced vegan, vegetarian, and gluten-free options. If you are looking to up your salad game, look no further. This recipe originally appeared in 2012 on an earlier blog, but I’ve updated and improved it.